A premium all in one music system equipped to receive DAB, DAB+, FM with RDS radio and Bluetooth as well as wi-fi internet radio; providing access to over 24,000 worldwide radio stations. Revo SuperSystem Bluetooth music system is the flagship of the SuperSeries, fusing traditional craftsmanship and authenticity with progressive digital technology, extraordinary room-filling audibility and prized design. SuperSystem incorporates the finest materials and mechanisms, its full-wood cabinet with anodised aluminium and steel front and back plate demonstrate tactility and elegance. A thorough graphical OLED display and control add innovativeness enabling quick and easy navigation, while dual 3.5” BMR speaker drivers and active subwoofer provide 80W of pure room-filling digital audio with exact clarity and satisfying bass. Every part of the design and production focuses on the acoustics with the state-of-art sound shaping techniques and meticulously concocted bass porting system. This leads to open sound with precision, detail and solid bass without coloration or distortion and profiting from a spacious sound field. SuperSystem communicates seamlessly with other devices and services. Network audio and WLAN lets you play wireless audio from computers and music servers, while the aptX Bluetooth provides CD quality streaming from smartphones or tablets etc. Spotify Connect unlocks over 30 million tracks from its archive. UNDOK puts you in full control of features plus the aptitude to produce a wireless multiroom system, thanks to the UNDOK app for iOS and Android. This integrates control of the various functions while other modes are also dispersed across a multizone network. The technology connects up to five SuperSystems or other compatible devices for a wireless multiroom system. Play different tracks in individual rooms, or just enjoy a single playlist throughout your living space, all controlled via the app. With Spotify Connect, simply hit play on your SuperSystem and the playlist you're already listening to on your smart device instantly fires up, right where you left off – ensuring you never miss a beat. Control your music without leaving your sofa or impeccably switch to another enabled unit in different room. Initiate calls, play a game or a video – the music will continue playing even when your phone or tablet is out of range. With Bluetooth technology, you can wirelessly stream music from your smartphone or any compatible device such as a laptop or tablet. AptX assures, where supported, music is streamed at CD quality instead of the usual MP3 quality. Owing to the addition of a patented BMR, the audio reproduction is exceptional. This transducer pools the benefits of a flat diaphragm speaker with the pistonic movement of a typical loudspeaker, generating a top-performing compact driver that can cover a wider frequency gamut. All this creates a level frequency response, wide stage and satisfying bass. SuperSystem is packaged with a full feature remote control for easy navigation of the menu and various modes. Alternatively, the UNDOK iOS/Android app gives you control from your smart device. Fitted with a convenient front USB port, SuperSystem easily charges devices such as smartphones or tablets. Moreover, it will playback MP3, AAC and WMA files from a USB drive or similar tool. Visually, SuperSystem is a timeless design with exceptional attention to detail that holds a lasting impression. 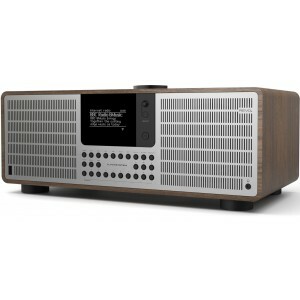 Clad in American walnut or matte finishes, the hand-made wooden cabinet has superior audio properties which lesser materials are incapable of providing. Top quality anodised aluminium is used for the grate and front while pressing steel for the back pane reinforces tactility and integrity that is not possible with lower-grade materials. You can choose between either black or silver grille.